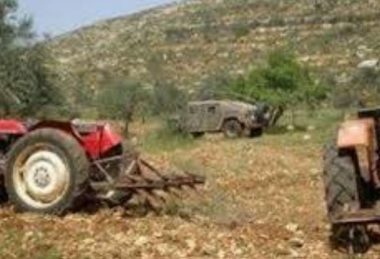 Israeli soldiers destroyed, on Wednesday evening, a water pipeline and bulldozed an agricultural road in ‘Atouf village, south of Tubas, in northeastern West Bank, in addition to confiscating a tractor and a water truck in the West Bank’s Northern Plains. Bashar Bani Odah, a member of ‘Atouf Local Council, said dozens of soldiers, accompanied by armored bulldozers, invaded an agricultural area, owned by the villagers, before destroying a water pipeline and bulldozing an agricultural road leading the targeted lands. He added that the soldiers attacked a nonviolent procession against the escalating Israeli violations targeting the Palestinians and their lands in al-Baq’a Meadow, in the same area, wounding at least fifteen, and abducted two Palestinians, including a journalist. In related news, the soldiers illegally confiscated a tractor and a water truck, owned by Jamil Khdeirat, from Bardala village, in the West Bank’s Northern Plains. Israel controls all water resources, and frequently disconnects water supplies, an issue that forces the Palestinians to buy water, which is delivered to them by water trucks, for higher prices than they would normally pay if they had constant running water.